Regardless of where you live there is something to be said for the aesthetic and functional benefit of having a fireplace in your home. You may only use it once or twice a year but the crackling firewood or blaze from a gas source adds a feeling of warmth and hominess to the room that cannot be duplicated by lights, candles or lamps. 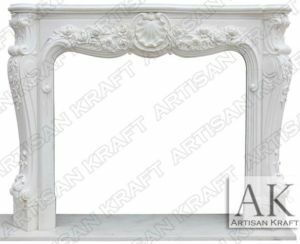 You can take advantage of creating your own unique fireplace framework by ordering ornate or simple surrounds sold online by vendors who specialize in manufacturing and building these large pieces that influence and enhance this particular feature. Marble is one of the most popular materials utilized because of its durability, unique texture and classic association to the fireplace and there are multiple options to choose from when you work with a top quality vendor. Marble fireplace surrounds are basically the frame that includes the bottom hearth piece, sides and mantel or a variation of this design based on your location and current setup. While brick is very often seen in homes because it is low cost there is also very little originality or design that can be combined with this product. Marble, on the other hand, has rich texture with veins of color running through the composite, carvings and etchings for designs and a solid sturdiness that cannot be matched. Customers can select products that are ornate with many designs or keep it simple with only a few etchings or none at all and the marble can speak for itself in the natural state. The key is to work with a vendor that has high ratings for quality and can provide delivery and installation for a final result that is professional looking and stable for future use. Just having a fireplace may not be enough when you want this feature to the focal point of the living area so make sure that you enhance it using the very best in materials and have the dedicated technicians handle the details for you. The ideal marble fireplace surround online is waiting for you, so place your order today.